We are specialized in Indian food. We are a franchise and we are the biggest chain in Indian restaurants that has locations across continental USA, with more than 40 locations and growing. Guests love our food from delicious butter chicken to the famous Samosa, we have varieties of food that make your mouth soothe in sweetness to the most spicier options that make you sweat. We have experience in organizing events from a team gathering to a wedding with more than 1000 people, we have done it all. We have a specialized team of experts that are on stand by for any of your catering needs. Prices offered are for Minimum 30 Guests and Maximum 150 Guests. Contact us for Special Event Pricing. 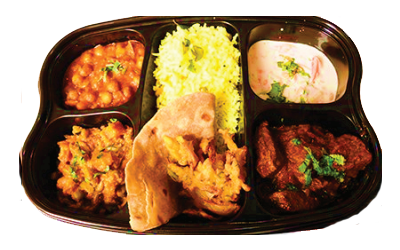 Quantities provided are based on mixed serving in Buffet style at home with all the items in the package. For more limited menu items please order by the tray. If you have special events (outdoor/weddings), we recommend to order by tray. Please call us at (813) 328-5857 or send us an email to info@bawarchibrandon.com to talk to our catering specialist and give us the opportunity to make the event even more memorable.